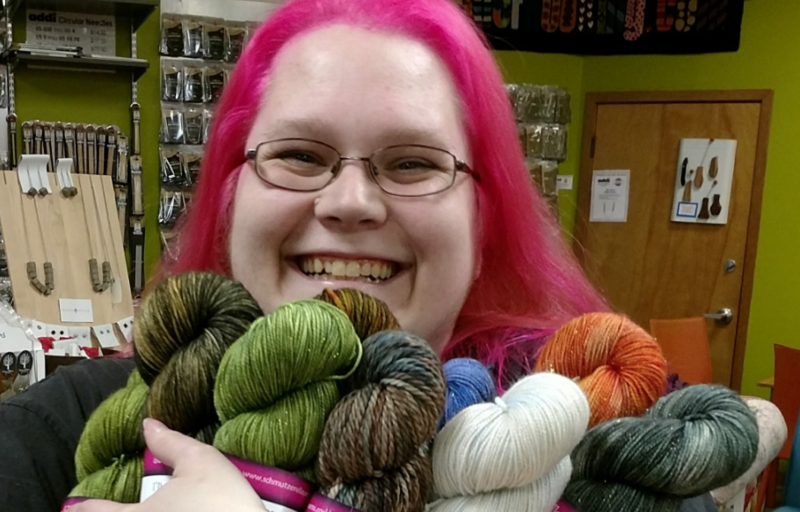 Join Nancy Torrance of Schmutzerella Yarns for a trunk show featuring her fun hand dyed yarns. Nancy Torrance is the creative genius, mad scientist, epic nerd, owner and dyer behind Schmutzerella Yarns. Born and raised in the Pacific Northwest, currently calling Everett and Snohomish home. She is obsessed with yarn and spends most of her free time knitting, but also likes to crochet, weave, and spin and she enjoys other crafty pursuits including baking, cross stitch, and painting. All the crafts all the time always. Nancy’s first fandom love was Harry Potter and even once sewed a cloak and dressed up as Hermione for a book report. In high school. Complete with a stuffed owl pinned to her shoulder.